These plant-based vegan Mini Maple Pumpkin Cocoa Cakes are for after the Yom Kippur fast. It is a tradition in some families to break the Yom Kippur fast with water or tea, followed by a piece of cake. People relax for half an hour to an hour and then come back to eat a meal. This is actually recommended, because it allows us to rehydrate and prevents us from overeating out of hunger. Making good food choices to break the Yom Kippur fast eases your body out of the 25-hour fast in a supportive way (your digestive system will thank you). This tradition is also comforting and cozy. Let us keep this lovely tradition and serve healthier cake. Traditional cakes have eggs, butter or oil and sometimes milk. Animal ingredients are heavy especially after a 25 hour fast. Better to break the fast with plant-based foods. Actually, I take that back, the best thing to do after the fast is to drink a large class or water and then have a cup of hot tea with this cake. These Mini Maple Pumpkin Cocoa Cakes are delicious. 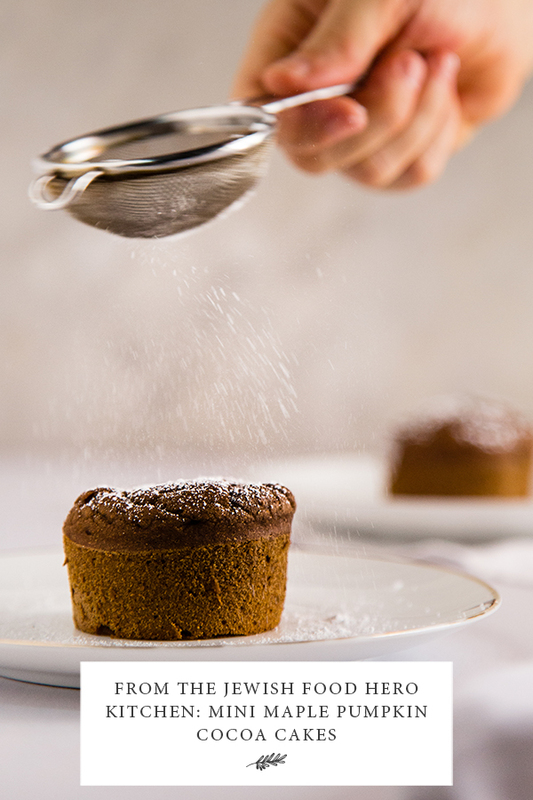 The mini cakes have a perfect level of sweetness, are satiating (from the pumpkin puree) and have a slight cocoa flavor (from raw cocoa powder) that tastes just right after fast. I even added some fresh orange juice to the cake to give it a fresh taste. The pumpkin makes the cake moist and satiating. These can be made the day before and kept refrigerated until 2-3 hours before serving. You can heat them up in a toaster or an oven or enjoy them at room temperature. One thing I want to try this coming year is replacing the rice milk ingredient with fresh cooled coffee. I think that touch of coffee would be delicious and the caffeine would probably feel good after the fast. Anther change I want to make make to the below recipe is replacing the raisins with these vegan mini chocolate chips. Combine flour, baking powder, baking powder in a large mixing bowl. In blender combine rice milk, applesauce, pumpkin puree, cinnamon, salt, orange juice, lemon juice, sugar and maple syrup and blend until completely mixed. Add the wet mixture to the flour mixture and combine evenly. Pour into paper cups in a muffin pan. Bake at 425 F for 7 min and then turn the oven down to 350 F and bake for additional 20-25 min. Dust the mini cakes with powdered sugar. Your turn: Tell us in the comments what healthy vegan cake recipes you love.